If you’re planning to go to Walt Disney World this summer, be sure to catch the summer edition of “The Magic, The Memories, and You!” Castle projection show at the Magic Kingdom. Disney Channel stars Phineas and Ferb kick off a rockin’ celebration that visits the beach, the jungle and under the sea with favorite Disney characters and cherished Disney music – all playing out on Cinderella Castle. As part of Disney’s “Let the Memories Begin,” the ten-minute, nighttime spectacle features photos of guests captured in the park that day projected among the spires, towers and turrets of Cinderella Castle. 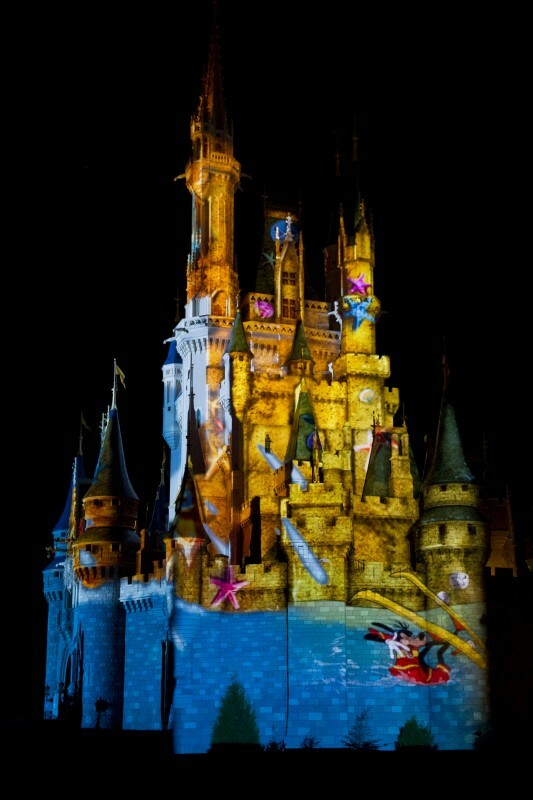 In California, the new summer show is projected in a similar fashion onto “it’s a small world” in Disneyland. Along the way at Disney World, the Castle goes through some dramatic, eye-filling transformations, from sand castle to ancient vine-covered ruin to colorful finger-painting to tropical aquarium. You’ll be able to hang ten with surfin’ Goofy, join Timon and Pumbaa in singing Hakuna Matata, and rock out with Ariel, Sebastian and the hot crustacean band at the bottom of the ocean. I had a chance to see the new show first-hand when I was there last month and it was quite impressive. I had checked out some videos online and honestly, I just wasn’t that impressed. I’m a purist when it comes to the castle – except for the Dream Lights at Christmastime but that’ll be a later post! – but once I saw this show in person I understood why so many of my friends were raving about it. Don’t miss this one – it’s definitely better in person, by far! Show times vary depending on park hours so check your times guide when you arrive. Have you seen it yet? Leave a comment to share your impressions of this show.